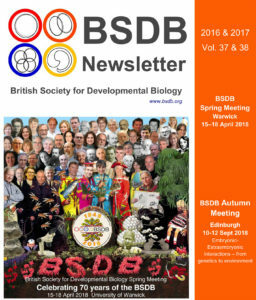 Please, have a look at the newest issue of the BSDB newsletter, which can be downloaded here. It covers two eventful years of our society’s history and is by far the longest ever published! This seems only appropriate considering that 2018 marks the 70th anniversary of the BSDB’s foundation. In recognition of its history, the BSDB has decided to digitise all its newsletters which have recently been re-discovered in an almost forgotten archive. They will be gradually uploaded on our archive page (bsdb.org/about-us/bsdb-newsletters) where issue no. 1 from 1979 has already been linked out to get the ball rolling. We have now first lists of the archive’s contents which seem to date back to the early 60s. If you have an interest in these, please contact comms@bsdb.org. Also, if you have further thoughts on how to catalogue and store the archive safely for the future, please let us know. This is my final newsletter as communications officer of the BSDB. I must admit that I enormously enjoyed the task, and can only hope that the changes to our website and the ways in which the society has been represented during my time in office are seen positively by our members. It is my pleasure to announce that Ben Steventon (p.6) has agreed to take over as BSDB communication officer from autumn 2018. I am confident that he will do a brilliant job. Unlike previous editions, this newsletter covers two years of our society’s life. But honestly, did you even notice the delay? Extrapolating from the download metrics of former newsletters, the long gap is very likely to have gone widely unnoticed, and I can see two reasons for this. Firstly, on the positive side, all our society news is now being published more promptly on our website or on The Node. This changes the nature of the newsletter from being a source of primary information, and turns it into a legacy item or even a historical document for future BSDB generations. This is reason enough for the BSDB to continue with its newsletter. Secondly, a reason of more concern is that the low viewer numbers likely reflect a tendency of communication fatigue in our community. Let me briefly extend on these thoughts before outlining the content of this newsletter. If I have done my job well for the last two years, the contents of this newsletter should no longer be news to you, but rather be a reminder of our active society life during this period. I have made every effort that news was brought to you promptly via our website or through The Node. Of these, The Node has become an increasingly important medium. Maintained by The Company of Biologists as a communication platform for the community of biomedical scientists, it has taken on the form of a modern electronic newsletter that reaches out internationally. As explained in a recent publication, The Node’s community manager Aidan Maartens either authors or commissions meeting reports, book reviews, obituaries or interview transcripts, and collates community-relevant information about meetings and workshops. Importantly, we as individuals or societies can use The Node as a communication platform to advertise jobs and events, write about science-related topics, explain our latest publications, or share community-relevant experiences. Once registered, we can publish freely and ‘uncensored’ as long as we keep within The Node’s reasonable rules. In this way, we can capitalise on a very well established communication platform, which is further enhanced by The Node’s Twitter and Facebook accounts, each with thousands of followers. Much of the science-related news that would previously have been disseminated via the BSDB newsletter or website, is being covered by The Node, taking an enormous work load off my shoulders – and the same can likely be said for Developmental/Cell Biology societies worldwide. There is true synergy and, naturally, more community members visit The Node’s website than the BSDB’s. Consequently, I closely collaborate with Aidan and follow a strategy in which many of our news posts are published on The Node – of course always making sure that they are likewise accessible through our own site. This said, the BSDB website still has an important purpose. User metrics indicate that our site has its prime function in BSDB-specific information, such as our conference and travel grants, awards and meetings and committee information. I take great care that these pages are updated as soon as new information is available. Please, let me or Ben know if there is anything that’s wrong or missing – we’ll act swiftly. Regardless of whether newsletters occur in static journal format or as dynamic websites, they often are important motors for scientific communities and their science, as is well explained in an article by C. M. Kelty from 2012. But does this strategy still work effectively? I sometimes feel that we were better informed in pre-internet times when information was less abundant but focussed on the essentials, and when dissemination was easier because the readership was hungry for information. Today, we tend to see quantity over quality: more than a hundred emails rain into our accounts every day, and social media timelines have become so busy that there is hardly time to view even a fraction of the messages. And, even if information is being read, I see little evidence that this leads to impactful social media debates. Furthermore, the sharing of information on social media is short-lived and often ineffective as can be deduced from viewer metrics of shared links. Even the use of social media as a mere source of professional information seems to fail: a survey by The Node showed that most members of our community have no Twitter account. Even more alarmingly, subscription rates to websites are low (~900 for The Node and ~150 for the BSDB), when considering that the BSDB alone has a ~1400 strong membership. In a nutshell, besides not reading the newsletter, many of us are not tapping into the existing online community news channels. In consequence, important information can no longer be disseminated effectively and reliably, and our community no longer has the means to develop a common voice. This clearly weakens us in times where the need for communicating the importance of fundamental science is perhaps greater than ever. In recognition of this challenge, many contributions in this issue are dedicated to the topic of science communication: our chair Ottoline Leyser speaks about the importance of communication (p.4); a dedicated article explains the BSDB’s advocacy campaign in collaboration with The Node (p.23); an overview of a recent special issue on science communication in the field of biomedical science is being provided (p.27); our student and postdoc representatives announce a writing competition aiming at advocacy (p.31); the example of an advocacy article for Open Access Government is given (p.78). As usual, the start of this newsletter is made by the chair’s and officers’ reports. In the chair’s address (p.4), Ottoline Leyser reflects on the BSDB as an inclusive, co-operative, and outward looking society, and the need to uphold these traits in times of Brexit and worldwide political tendencies of isolationism; Ottoline ends her address with some thoughts on the importance of communication. The secretary’s report by Kim Dale (p.5) highlights the positive developments of the BSDB in terms of its steadily growing membership. She notes that, in 2018, the committee will see a turn-over of 5 members (see also p.7) – so await a call for nominations before the next Spring Meeting. In the same vein, the three new members that have joined the committee in 2017 are being introduced on page 6. The meetings officer Joshua Brickman (p.9) looks back at the BSDB’s excellent meeting record of the last two years (see also meeting reports on pages 11 and 14), and gives an outlook on the exciting meetings planned for the next three years (see also p.10), including the BSDB’s 70th anniversary meeting taking place 15-18 April 2018 in Warwick (see this issue’s cover image). The treasurer’s report by Chris Thompson (p.19) is an impressive account of the high number of members that were supported to attend meetings or workshops in 2016 and 2017, and sends out the reconfirming message that our financial status remains solid, providing the BSDB with continued capacity to support its members and their science-related activities. Our student & postdoc representatives, Alexandra Ashcroft and Michelle Ware (p.30), report about their outstanding efforts to deliver on the requests of junior members expressed during the survey from 2015. In response, Alex and Michelle introduced a very successful career workshop (see the respective reports on p.32) and a new career website (detailed on p.35). Finally, the newsletter concludes with reports about our main awardees of the last two years, in particular the winners of the Waddington (p.38), Cheryll Tickle (p.41) and Beddington medals (p.45), as well as the two Dennis Summerbell awardees (p.47), and 14 project reports by students who were supported by the Gurdon/The Company of Biologists Summer Studentship scheme. See a complete overview of all awardees, including poster prize winners (p.36) – and remember that most award lectures were documented and are available on our YouTube channel.